Haad Tien Beach Resort, the five-star boutique resort on the pure shores of Koh Tao, is inviting guests to experience the best this beautiful destination has to offer with an exquisite new package. By booking the Chill Out package, guests can enjoy the best of Koh Tao including luxurious villa accommodation, daily breakfast for two at our seafront restaurant, and a classical Thai massage for two at Tien Spa. Guests can also explore the island’s stunning scenery, both above and beneath the waves, with a half-day long-tail boat ride and snorkelling trip around Koh Tao and Koh Nang Yuan, including lunch for two. Back at the resort, our chefs will serve up a sumptuous seafood sharing platter plus two glasses of sparkling wine, overlooking the azure sea. This sublime three-night package also includes transfers to and from Mae Haad Pier and a tropical welcome drink upon arrival. For more information and to discover The Best of Koh Tao at Haad Tien Beach Resort, please email reservations@haadtien.com. Step into a world of romantic bliss at Haad Tien Beach Resort, the five-star boutique resort on the pure shores of Koh Tao. 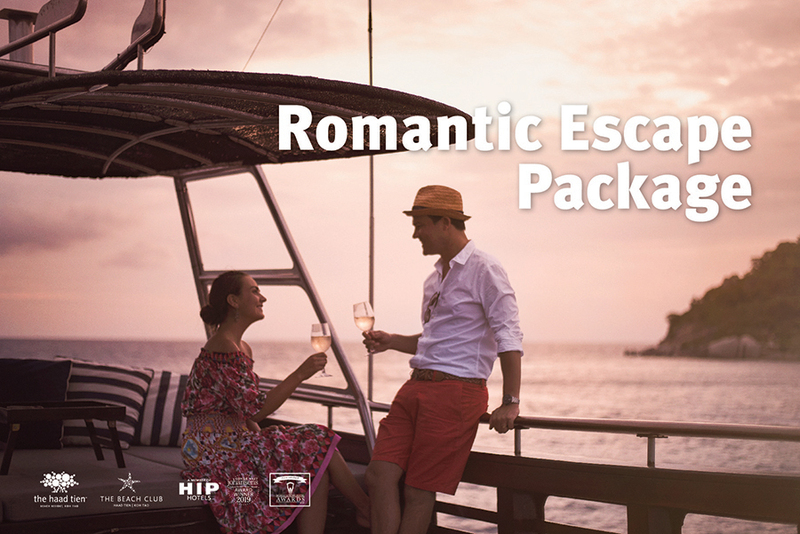 Our two-night Romantic Escape package invites couples to relax and reconnect with each other in paradise, free from the disturbances of daily life. Your fairy-tale stay starts with a romantic wine set-up upon arrival and continues with a Thai set dinner and sparkling wine for two, a 60-minute couple’s Aromatherapy & Milk Bath at Tien Spa, and an unforgettable long-tail boat ride and snorkelling trip around Koh Tao and Koh Nang Yuan, including lunch for two. Guests will also enjoy daily breakfast for two at our seafront restaurant, transfers to and from Mae Haad Pier and tropical welcome drinks. For more information and to book your romantic rendezvous at Haad Tien Beach Resort, please email reservations@haadtien.com. Take a break from the stress of the city and unwind in paradise on the pure shores of Koh Tao. Haad Tien Beach Resort invites all Thai residents, including expats, to experience a blissful break at our five-star boutique resort, including luxurious villa accommodation, daily breakfast for two at our seafront restaurant, transfers to and from Mae Haad Pier and a tropical welcome drink upon arrival. 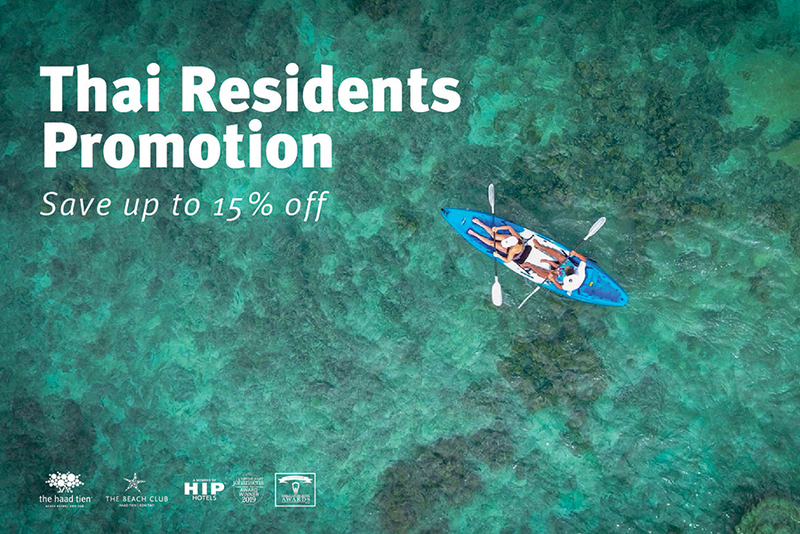 To encourage guests to truly relax, we’ll also offer an enticing 30 percent discount on treatments at Tien Spa, and 10 percent discounts at the PADI-certified Reef Dive Centre. Terms and conditions apply. For more information and to book your stunning staycation at Haad Tien Beach Resort, please email reservations@haadtien.com. If you’ve never experienced scuba diving then Haad Tien Beach Resort is the perfect place to start! Our Discover Scuba Diving package gives you the chance to learn the basics of diving with the PADI-certified instructors at our onsite Reef Dive Centre. 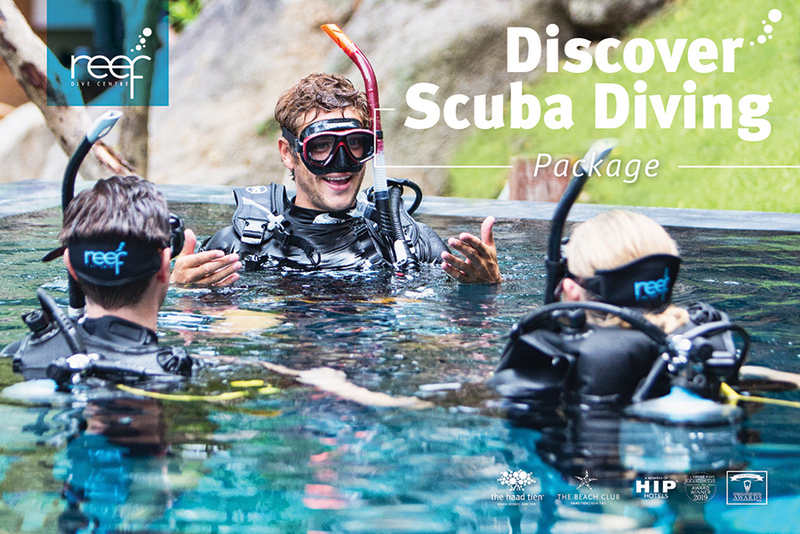 After practice sessions in our dedicated diving pool, you’ll be fully prepared to head out into Koh Tao’s calm, shallow seas and discover the incredible underwater world, including colourful corals, tropical fish and more. Your instructor will help with your equipment - all you have to do is enjoy this amazing aquatic adventure! As well as learning a new life-long skill, this two-night package includes daily breakfast for two at our seafront restaurant, transfers to and from Mae Haad Pier, tropical welcome drinks and a Thai set dinner for two. 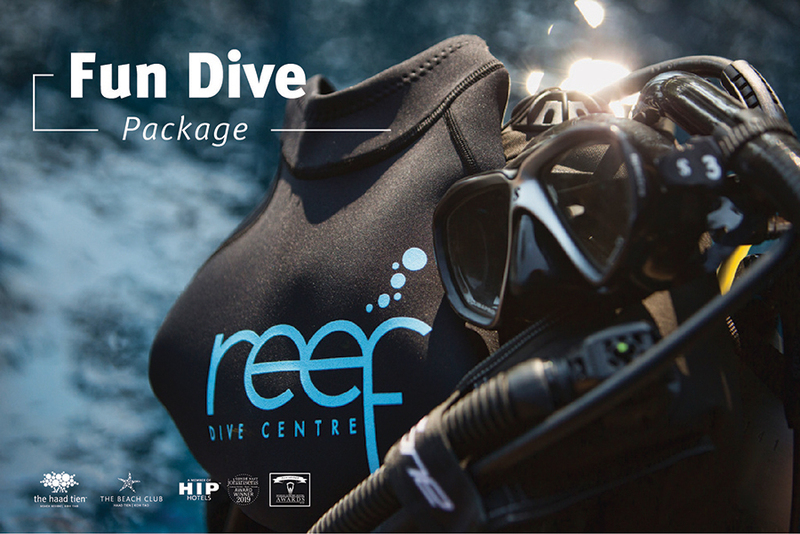 For more information and to learn to dive at Haad Tien Beach Resort, please email reservations@haadtien.com. Koh Tao is one of the world’s most spectacular diving destinations - a tropical underwater wonderland that never fails to amaze. Certified divers can now enjoy a dedicated two-night diving break at Haad Tien Beach Resort, including luxurious accommodation and two dives with our PADI-certified Reed Dive Centre. Our morning or afternoon excursions will take you to some of Koh Tao’s best diving destinations, including Shark Island, Laem Thian Caves, HTMS Sattakut, Green Rock and more. Expect to see colourful coral gardens, tropical fish, sea turtles, giant barracuda, sting rays and even whale sharks. This package also includes daily breakfast for two at our seafront restaurant, transfers to and from Mae Haad Pier, tropical welcome drinks and a Thai set dinner for two. For more information and reservations, please email reservations@haadtien.com. Would you like to become an open water diver? 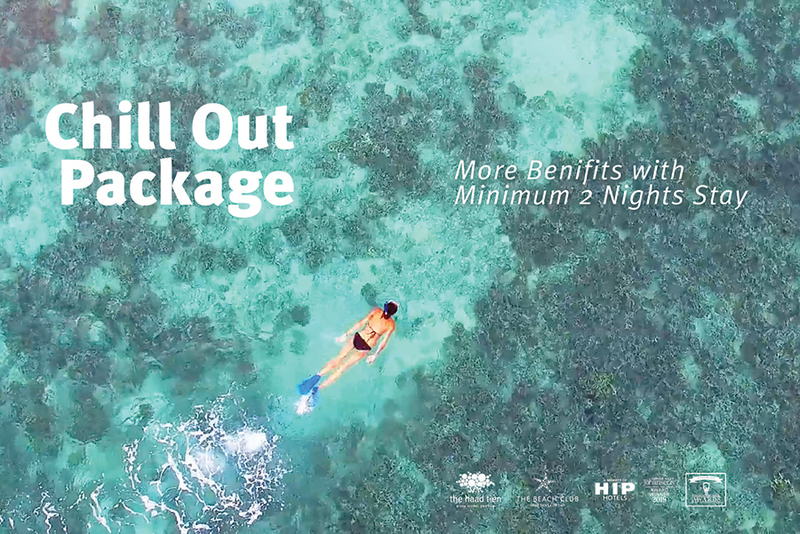 This immersive four-night package allows you to earn your Open Water Diver certificate at our PADI-certified Reef Dive Centre, while also enjoying luxurious accommodation and a series of extras at Haad Tien Beach Resort. 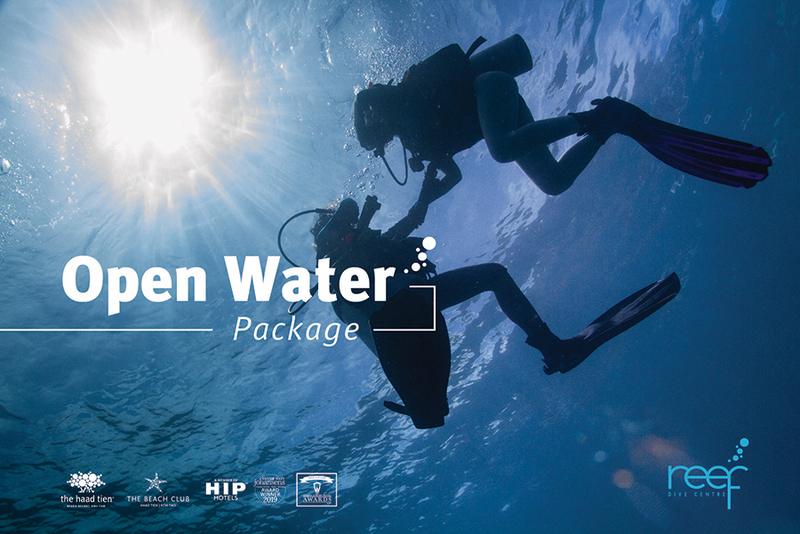 By booking our Open Water package, guests can take the PADI Open Water Diver course (which runs daily), including all training materials, diving equipment, sessions in our dedicated dive pool and at sea, followed by four open water dives over two days, assessed by our instructor. Upon completion, you’ll be a certified open water diver, able to dive at any location in the world!